Thank you sir! BUUUUUUT - The last one is my best, IT TOOK ME TWO DAYS TO BEAT YOUR SCORE AND SLEEPLESS NIGHTS. *My fault for not putting in the proper way* - did you see the one above the last score? I about fell over hahahaha. Also should I add to hwbot? To make it easier (sorry about that), but seriously, look at the damn tie I got with you. When I added your score only the 20707 was the only one showing. umm. 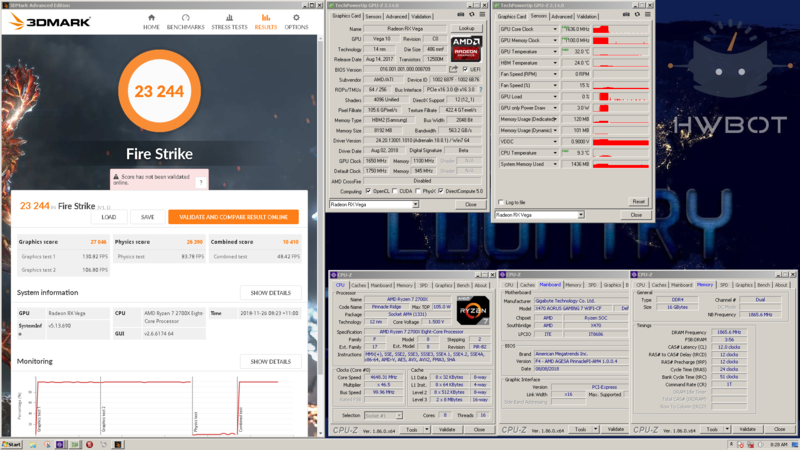 i had the same instances of gpuz (main screen) and cpuz (main screen, motherboard, and memory) open in the exact same position, in both screenshots. they do have a dark theme, so you might have missed them in the second pic (??? You saw them in the first pic ???). you'll see them on the right hand side of the screenshot below and just to the left of the task manager performance stats. How!? I am in utter amazement now. Was clipped off in the first picture until I opened it in another tab. Can you add in the screenshot like it's shown in the OP? Thought I'd see what the 1055t and RX 580 would do in Firestrike, not too shabby considering the age of the CPU (not trying to make an official score post, yet) I need to push the 1055t to 4.0GHz and see if I can tweak the memory and GPU (just bought the RX 580 - Powercolor Red Dragon 8GB yesterday MicroCenter had a deal I couldn't pass up at $169.99). But I will post an official score soon.